Ryukyu Mura – Ryukyu Village – is a theme park about the traditional culture in Okinawa. There are traditional residences in the village, with red tiles on the roof and stone walls around them to defend them against typhoons, and some workshops are also available for visitors. It is located in the north of Naha. This is cool. 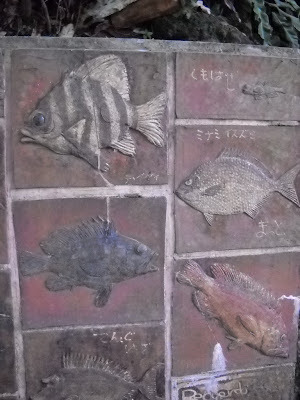 I am always impressed by the dedication that it takes in order to cut such a detailed picture in stone - trully amazing! And their love for fish is fascinating. I noticed photos, drawings and symbols of fish quite everywhere. Apart from the many fish dishes, of courses.